Yellow Creek Mennonite Church (Mennonite Church USA), located in Goshen, Indiana, is a member of the Indiana-Michigan Mennonite Conference. The first meetinghouse used by the settlers who began coming into the area in 1845, led by the aged Bishop Martin Hoover (ca 1761-1850) of Medina County, Ohio, was a log building one-half mile north of the village of South West, a short distance south of the present Yellow Creek Church of the Brethren. In 1849 the Yellow Creek Mennonites built a log meetinghouse 26 feet square on the plot where the old cemetery now is located on the east side of the road. This was later enlarged. In 1861 Andrew and Lydia Bigler sold two acres to the "Old Mennonite Church" for $200.00. This is the site of the present Wisler meetinghouse across the road from the 1849 meetinghouse. On this lot the congregation built a frame meetinghouse 40 x 60 ft. When John F. Funk attended the annual fall conference at Yellow Creek in 1862 he estimated the Elkhart County Mennonite membership at 400-500. A visitor, Deacon Frederick A. Rodes of Virginia, estimated the capacity of the meetinghouse at 500-600, but Bishop John M. Brenneman, who served as moderator of the conference, estimated the number of the communicants at 300-400. On this occasion in 1862, 46 members were baptized. 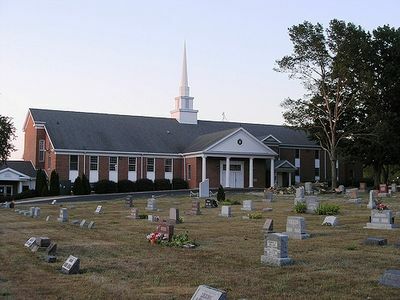 After the new meetinghouse was built in 1861 the 1849 meetinghouse was moved to the northwest corner of Section 16 of Union Township, where it came to be known as Blossers Church and served as a sort of outpost of the Yellow Creek congregation, along with Shaums (Olive), Holdeman, and Christophels. After the Wisler division (1872) the Wisler and Funk groups alternated in the use of the Yellow Creek, Blossers, and Shaums meeting houses. In 1907 the Wisler group split into two groups, which together bought the meetinghouse of the "Funk Congregation" (MC) at Yellow Creek in 1912. The Funk group then built the present brick meetinghouse a short distance to the north of the frame meetinghouse, and enlarged it in 1948. In 1874 the Brenneman (Mennonite Brethren in Christ) schism occurred when Daniel Brenneman, a progressive younger minister, was discharged, and his wing organized the Bethel Church 1.5 miles northwest of the Yellow Creek meetinghouse. The membership of the Yellow Creek congregation (MC) was reported as only 80 in 1890 (J. F. Funk) and 129 in 1896 (Deacon Jacob G. Long). These low figures are accounted for by the schisms of Jacob Wisler and Daniel Brenneman in 1872 and 1874 as well as by the full congregational organization of what had originally been Yellow Creek outposts: Shaums (Olive), Holdeman, Salem (merger of Blossers and Christophels), and the Prairie Street Mennonite Church in Elkhart. In 1958 the membership at Yellow Creek had grown to 326, and the bishop-pastor was Peter Wiebe. Yellow Creek is the center of the large Mennonite (as contrasted with Amish Mennonite east of Goshen) settlement west of Goshen. In 2014 the Ministers were Wes J. Bontreger, Jason Mark Ramer, and Harold J. Yoder. Membership was 559. John F. Funk diaries and private papers. Wenger, John C. "Yellow Creek Mennonite Church (Goshen, Indiana, USA)." Global Anabaptist Mennonite Encyclopedia Online. 1959. Web. 25 Apr 2019. http://gameo.org/index.php?title=Yellow_Creek_Mennonite_Church_(Goshen,_Indiana,_USA)&oldid=121525. Wenger, John C. (1959). Yellow Creek Mennonite Church (Goshen, Indiana, USA). Global Anabaptist Mennonite Encyclopedia Online. Retrieved 25 April 2019, from http://gameo.org/index.php?title=Yellow_Creek_Mennonite_Church_(Goshen,_Indiana,_USA)&oldid=121525. Adapted by permission of Herald Press, Harrisonburg, Virginia, from Mennonite Encyclopedia, Vol. 4, pp. 1002-1003. All rights reserved. This page was last modified on 19 April 2014, at 20:19.